Introduction. The objective of this article is to study how Spanish parliaments incorporate interactive features in their online press rooms as a form of communication, not only with news media organisations but also with citizens. Methods. Content analysis was performed in the online press rooms to evaluate their accessibility, information content types, and interactive possibilities. Results and conclusions. The results show an excellent level in terms of accessibility standards, a divergent incorporation in relation to channels and tools (dissemination of press conferences, real-time broadcasts, for example) and a limited promotion of citizen participation in such aspects as suggestion boxes, the ability to make comments and the use of synchronous tools, among others. Online press rooms; institutional communication; public communication; citizen participation; interactivity. 1. Introduction. 1.1. Relevance of online press rooms as an object of study. 1.2. The concept of interactivity. 1.3. Objectives. 2. Proposal of a methodological model. 3. Results. 3.1. Accessibility. 3.2. Information contents. 3.3. Interactivity and participation. 4. Discussion and conclusions. 5. Notes. 6. References. In contrast to the traditional political communication model, which is based on an asymmetric, top-down relationship focused on the media as public opinion setters, in the information society, and due to the massification of the internet, a new space for communication has emerged with new opportunities and challenges for citizens in the area of access and participation in the political and media discourse. At the same time, the internet has allowed the expansion of the communication possibilities between public institutions and the media. This new communication environment has its own characteristics, such as the ability to instantly access information and the reduction in distribution costs. Just as journalistic enterprises have gradually incorporated technological developments in their news production and distribution processes (Sarrica et al., 2010; Stroud, Scacco and Curry, 2016), organisations have also done so in their communication flows with different audiences (Taylor & Kent, 2004; Sweetser and Lariscy, 2008). One of the main scenarios in which these changes converge are online press rooms, which offer wide possibilities for communication with citizens, eliminate the restrictions imposed by journalists in the news consumption process, and allow for a better response to the information needs of the media for the development of their work. The integration of parliaments’ public communication to the first sector within organisational communication theories (García Orosa, 2009) involves, in addition to a series of legal obligations that do not exist in private enterprises and NGOs (second and third sectors, respectively), a higher demand in terms of the participation that should be allowed from citizens, as recipients and stakeholders of these actions (Del Rey, 1996). With the technological development and the proliferation of the internet, we are witnessing an era marked by the debate on the contribution of information and communication technologies (ICTs) to democratic and participatory processes. In the heat of this discussion, there are optimistic positions that say that technological development empowers individuals (Naisbitt, 1983; Toffler, 1980). “As a result of this, new concepts have emerged, such as “teledemocracy” (Arterton, 1987), “e-democracy” (Grossman, 1995), “cyber-democracy” (Tsagarousianou, Tambini and Brian, 1998), “open governance” (Ramírez-Alujas, 2013), and “replicant democracy” (Dader, 2003), all of them associated with the idea of horizontality, symmetry and civic empowerment. Against this position, there is another much more critical position has emerged in relation to the effects of ICTs on democracy. Although most of the authors within this strand agree that digital networks and media can have applications and very helpful effects on citizen participation and the expansion of democracy, they also consider that the potential of ICTs is thus conditioned by those who control access to them and that they can be (and are in many ways) a source of new gaps (Echevarría, 1999; Castells, 1998). In this regard, the scientific literature has been interested in the possibilities that the internet offers to public institutions to maintain their relations with the public: web pages (Taylor & Kent, 2004), Facebook (Sweetser and Lariscy, 2008, Túñez and Sixto, 2011; Díaz-Campo and Segado-Boj, 2015), Twitter (Simelio and Molina, 2014; Vázquez-Sande, 2016), open-parliament platforms (Pineda-Martínez and Castañeda, 2014) and online press rooms (Xifra, 2011; García and Vázquez-Sande, 2012; Bonsón, Torres, Royo and Flores, 2012; García and Vazquez-Sande, 2013). Most of these works have revealed the deficit of transparency and interaction on the internet by the political class, both in Spain (Dader, 2003; Dader and Campos, 2006; Marcos and Rovira, 2006; Cabezuelo and Ruiz, 2010; Túñez and Sixto, 2011; etc.) and other countries (Taylor & Kent, 2004; Sweetser and Lariscy, 2008). The conclusion that emerges from this research is that, like any tool, the internet does not generate improvement by itself, but that it depends on the use politicians make out of it (Zamora and Álvarez, 2006; Dahlgren, 2005). In what refers specifically to the online press rooms, the general trend has been to conceive them as tools to establish and maintain relations between organisations and the media (Callison, 2003; Xifra, 2011). Castillo, for example, defines them as “networked communicative spaces that contain tools and activities directed at media organisations” (Castillo, 2006: 2). Meanwhile, Xifra (2011) points out that online press rooms have a double function: a dynamic function focused on the management of relations with the press; and a documentary one aimed at the archiving of information that may be of interest to journalists. Thus, research works on online press rooms consider them as one of the main channels for communication between organisations and the media, for example, in the case of large international companies (Callison, 2003; González-Herrero and Ruiz de Valbuena, 2006; Momorella and Woodall, 2005), public institutions (Xifra, 2011; García and Vázquez, 2012; Bonsón, Torres, Royo and Flores, 2012; García and Vázquez, 2013), and even museums (Marca, Matilla and Mateos, 2014). At the same time, studies carried out so far in the area of public institutions have shown that there is a lack of general criteria regarding the architecture and content available in online press rooms (Ruiz, Iturregui and Martín, 2017). In the case of the Spanish ministries, they have not structured their news content or their access in a uniform way (Xifra, 2011), which presumably highlights the structural weaknesses of the public administrations in their communication policy. Another aspect that has been pointed out by previous authors has been the lack of interactive possibilities in the online press rooms of political institutions (García and Vázquez, 2012; Cantalapiedra, Iturregui and García, 2012). Thus, the first online press rooms consisted of little more than the publication on the internet of offline content, and, while there has been some evolution in this regard, the presence and use of the interactive possibilities continue to be seen as an important component of the press rooms and remains the focus of research. As Bajkiewicz, Kraus and Hong (2011) point out, online relationships with the media occur at multiple levels that go beyond a press release. Plummer (1995) detected that journalists complain about receiving emails with unsolicited and useless information. Online press rooms, although they can be used to make information consumption more tuned to the demands of journalists, neither seem to meet their needs (Ruiz, Iturregui and Martín, 2017). Barradas (2016) found out that Portuguese municipalities do not exploit the interactive features of online press rooms and concluded that journalists found it hard to carry out their work with the material provided by municipalities. In addition, journalists have criticised the ability of online press rooms to provide useful and updated content (Garrison, 2003). In this regard, the need to improve relations with the media via the internet has resulted in the creation of platforms, as it is the case of Menextra, a news alerts and distribution service for the media (Cantalapiedra, Iturregui and García, 2012; Genaut, Marauri, Cantalapiedra and Rodríguez, 2017). In any case, scholars agree that, while technology has meant major changes in practices and relations with the media, online communication does not replace face-to-face communication with journalists (Duke, 2001). On the other hand, as mentioned, it is possible to conceive online press rooms as facilitators not only of relations with the media, but also with citizens. As Castillo (2006) points out, “with the creation of these platforms we can generate new communication processes that are aimed at the media, but are also accessible to any person or institution interested in information about our organisation” (Castillo, 2006:2), which means that the informative processes should not be restricted to journalists and politicians. In this sense, it has been argued that the low costs of distribution of information on the internet turn citizens into potential media, while the online press rooms offer the public the opportunity to participate in the agenda setting with respect to institutional matters (Aruguete, 2017). Therefore, this study is presented as an opportunity to demonstrate the use of the online press rooms by public institutions as a tool for communication with the media and citizens simultaneously. Previous research has shown that building relationships based on the internet depends largely on the level of interaction of organisations (Jo and Kim, 2003; Saffer, Sommerfeldt and Taylor, 2013). It has been established that, when theorising about communication and technology, interaction is one of the central concepts to consider (Hansen, Jankowski and Etienne, 1996). This fact is particularly relevant when speaking of public institutions, since it is assumed they have a higher demand in terms of the participation that should be allowed. The theoretical contributions regarding the concept of interactivity have evolved over time. Schultz (1999) defines interactivity as a formal element of communication. Sundar, Kalyanaraman and Brown (2003), for their part, make reference to interactivity as a two-way process, which allows people to transmit and receive messages in a loop. Pavlik (1996) adds a new hue by describing the concept as a dialogue where actors can influence each other. Kent and Taylor (1998) suggest that the dialogue does not involve the resolution of a conflict, but simply refers to the exchange of ideas. Dialogic communication, they say, refers to “any negotiated exchange of ideas and opinions” (Kent and Taylor, 1998: 325), where the receiver, in addition to receiving the message, is trained to respond to the sender, which is the basis of a relationship. In this sense, Jo and Kim (2003) point out that interactivity has a significant effect on the construction of relations. Gustavsen and Tilley (2003) define it as “the levels of reciprocity provided by a site during the process of its use” (p. 2), warning that the fact that a web site is highly interactive does not make it more useful. These authors, with the intention of bringing precision to the definition of interactivity, allude to six features that compose it: user control, response capacity, real-time interaction, connection, customisation and fun. Saffer, Sommerfeldt and Taylor (2013) have shown that the interactivity of the organisations on Twitter affects the quality of relationships with their audiences. This connection, interactivity and quality of relations, has also been recognised by other studies (Avidar, 2013), as well as the connection between the interactivity and the perception of the reputation of an organisation (Guillory and Sundar, 2014). In recent years, the concept of interactivity has also been defined not only as an element of human communication, but also as interactions between people and machines (McMillan, 2006). Already in 1997, Botan argued that dialogue is more of an orientation of communication than a method, technique or format (Botan, 1997), so that the integration of interactive mechanisms does not guarantee interactivity. According to Schultz (1999), machines can only mediate (impede or facilitate) interactive communication. The purpose of this study is to examine how Spanish parliaments incorporate interactive features in their online press rooms as a form of communication not only with the media but also with citizens. Specifically, the article examines the accessibility, informative contents, and interactive possibilities of online press rooms. This research is relevant and timely given the growing use of the internet by citizens and the media, as well as the ease with which interactive mechanisms can be integrated in the press rooms of public institutions. 1 social network or email; 0 points if it does not include social networks or email. < 30%; and 0 if it is none. ***In the case of the Valencian Community, two websites were incorporated in the analysis given that the first is linked to the second, unlike the rest of the press rooms which are hosted on the same page as the Parliament. After having considered the definition of the new online press rooms, and presented the main theoretical advances regarding the notion of interactivity, this research has used the content analysis technique to examine the online press rooms of the regional parliaments of Spain. This is intended to confirm or refute the central hypothesis of the study: “The autonomous parliaments of Spain do not take full advantage of all the resources at their disposal to enhance interaction with citizens”. Based on previous research on this topic, which has determined the functions that a virtual press room should ideally possess (Callison, 2003; Xifra, 2011), we designed an analysis table that includes different variables relating to accessibility, information content and interactivity. Subsequently, to weight the levels promoted by the press rooms, we established a 240-point scale that integrates the parameters and values listed in table 1. The sample used for the empirical analysis includes the information units published between 1 and 31 December 2016 in the press rooms of 16 regional parliaments (n=401), as is broken down in table 2. The discrepancy between the 17 regional chambers and the 16 press rooms is due to the fact that the online press room of the Assembly of Madrid was excluded because its last publication dates back to 27 March 2015. A first level of analysis shows an important inequality in terms of communicative activity, since the average of 25.06 elements published throughout December 2016 highlights a remarkable difference between the most prolific (Aragon with 112 and Extremadura with 56) and the most austere cases (Canary Islands with 4 and Castile and León with 5 elements). The divergence is more apparent in the names of the pages that host these informative contents, which in many cases are overlapping spaces which, under a different name, are redirected to a same destination and in other cases are second-level tabs with a double identity (generic and specific). This explains why 27 names were detected, of which “news” was the most common: it was the name of 13 pages, and in 4 occasions was accompanied by other elements like the adjective “latest” (2), and the nouns “and events” (1) and “actualidad” (1). Below are the 10 sections that include the term actualidad (“news”) in their title, 8 of them without any added element and 2 of them with the word parlamentaria (“parliamentary”) or, as mentioned, next to the term noticias (“news”). The majority of remaining cases (4) revolve around the idea of “press”, but always accompany it with nouns that take users to media relations techniques (“press releases” and “press conferences”) or to the structures that produce such content (“Press centre” and “Press office”). Finally, only one parliament has chosen “communication” to name this material. Contrary to what happens with the great heterogeneity in the names given to the analysed spaces, regional parliaments do share traits in terms of their accessibility, since practically all of them (93.75%) present these contents in a specific grouped section -either on the same page of the parliament or a different one- and almost always (also in 93.75% of cases) give free access to all users, whether they are journalists or not, and grant access to the press room from the home page itself (also in 93.75% of cases). Aside from these major trends, the website of the Courts of Castile-La Mancha presents press releases and press conferences separately and in different sections. Meanwhile, in the website of the La Rioja Parliament the access system is mixed, since, although it is mostly free, the media library section requires identification with user name and password to view certain content. Finally, the access to the communications page (www.infocorts.net) of the Valencian Courts is complicated because this website does not belong to www.cortesvalencianes.es and it is only advertised in a press release of the 13 October 2016 and not prominently, which does not guarantee access. First of all, there is a deliberate confusion in parliaments with regards to the concepts of news and press releases, as they present as the latter (in many cases literally through the section in which they are offered and labels and classifications that are incorporated and allude to it) items that are not such a thing, like plenary agendas or weekly forecasts. With regards to the dissemination of periodical compilations (clippings) or interviews, none of the 16 press rooms incorporates any example of activities of this kind despite the interest that these formulas could generate for the general public and journalists. On the other hand, the dissemination of press conferences could be considered still an incipient trend, since less than a third (31.25%) opted for this tool, usually with videos, both pre-recorded and live. In the case of parliaments such as Aragon and Extremadura this section accommodates all political groups with representation, thus providing a representativeness in accordance with the election results, rather than a partisan use of this institutional communication channel. In another order of things, most Spanish regional chambers neither incorporate into their communication spaces a calendar of events. In fact, only 43.75% include some tool of this kind that includes both informative forecasts and issues relating to the regular functioning of the parliament (dates and times of commissions, plenary sessions, etc.). It is paradoxical that some communities such as Andalusia do include a space of “Calls and announcements” but do not provide content, and that other communities such as Navarre prefer to incorporate the weekly agenda as another press release (describing it as such and inserting it among the rest of the news). A fifth trend is related to the abundance of photographs in the communication spaces: 93.75% of the press rooms often complement with pictures the texts of the press releases, ranging from the large majority (62.5%) that incorporate at least one picture in all their press releases  and those that not always do so. Thus, Andalusia does so in 88.89% of its publications; Aragon in 82.35% ; Navarre in 77.8% and Valencia in 76.92%; while in the opposite pole, Castile-La Mancha only does so in 12.5% of its publications. Against the primacy of photography, videos, as an element that is published or embedded next to the text of a statement, are only present in 43.75% of the press rooms of the Spanish regional parliaments (regardless of whether they have video libraries or other sections in their respective websites). These contents, which are disseminated, both hosted and embedded, in the communications section and through other platforms, such as YouTube and Vimeo, appear less frequently than images. Thus, way below the previous percentages, only in the Asturian case 50% of text contents published in December 2016 are accompanied by video, which is well above the 25% of the chambers of the Canary Islands and Murcia; the 23.08% of Valencia; the 20% of Castile and León; and the 12.5% and 9.09% of the Basque Country and Castilla-La Mancha, respectively. The concurrency of photography and video, is detected are mutually exclusive in the Valencian case , while in the majority coexist both. Meanwhile, audio contents are minimally included, even though they are the essential element for radio platforms. In that sense, only 12.5% of the chambers take them into consideration as a complementary component to the text of press releases and always to a lesser extent than images. Thus, the contents of the press room of the Basque Parliament are accompanied by at least one photograph in 100% of cases, while only 9.09% of its texts are complemented with audio element; in the case of Murcia, 100% of press releases have pictures and only 25% contain audio. Finally, real-time broadcasts are going through a similar situation to audio contents, since this type of broadcasts are integrated in only 25% of the press rooms. Finally, with regards the 10 items included in this section in the analysis table, the most frequent is the search engine specific for press rooms, included in 62.5% of the analysed parliaments. The second most popular is the RSS services option, which are used to spread news contents quickly. This service is offered by 56.25% of these spaces, and in the case of Navarre this service is completed with the newsletter subscription option to receive news from this institution. Thirdly, “social buttons” have an identical presence, also in 56.25% of the press rooms of autonomous parliaments. Almost all of them privilege Facebook and Twitter (which can be linked directly in eight of the nine cases), followed by Google+ (in five), over e-mail dissemination (offered in five) and, finally, Pinterest (one case). However, the 7 remaining blocks are present only in a minority of the press rooms of the Spanish regional legislatures. The information on the communications department and contact details is scarce: only 1 of 16 cases (6.25%) disclose this information while only 12.5% publish their phone number. Information on the structure and composition of the cabinet is even more scarce (none of them disclose this information in the press room) as well as the identification of members (only the Andalusian Parliament includes the name of the person responsible, while other institutions scatter information, in other sections of their websites, on the identity of their manager of this area, as in the case of Cantabria and Extremadura). None of the websites disclose the name of the news editor, instead the author of the information is generic, which can hinder specific queries of journalists. Another tool that is poorly used is the suggestion box. Although this resource is made available in generic way to all citizens, its use by journalists is not promoted with a space of this kind, which is specifically aimed at them inside the press room. In fact, the Andalusian chamber includes a section to “contact the Press Office service” for “general inquires”, “consultation on the meetings of the different organisations”, “booking the press room”, “application for accreditation”, “request documentation”, “request interviews” and “request information from other institutions”. Figure 1. Levels of accessibility, types of content and interactivity in the online press rooms of Spanish regional parliaments. Meanwhile, the option for users to make comments on the different publications of the press rooms of the parliaments is almost non-existent as it is provided by only 1 (6.25%) of the 16 cases (Valencia). However, in view of the absence of comments on the 26 units of analysis of this specific case, with a total of 6,670 views, the research team decided to empirically determine whether the absence of contributions was due to citizens’ lack of interest or a technical impossibility. This activity showed that neither the Valencian nor the Spanish version of the website published successfully the comments made by the researchers, nor notified users about any technical failure. Thus, it is still unclear whether the will to participate is real or mere appearance . This Parliament is also exceptional as it is the only one that offers users the possibility to subscribe to its mailing lists in Telegram, regardless of whether they are journalists or not. Finally, none of the online press rooms used chat-type synchronous communication tools to allow contact with journalists, nor have their own social network accounts apart from the institutional accounts, which almost always were presented in these spaces. Figure 1 shows in increasing order the scores obtained by the online press rooms of the Spanish regional chambers, incorporating the values that have been accumulated in the three blocks of analysis (accessibility, contents and interactivity). 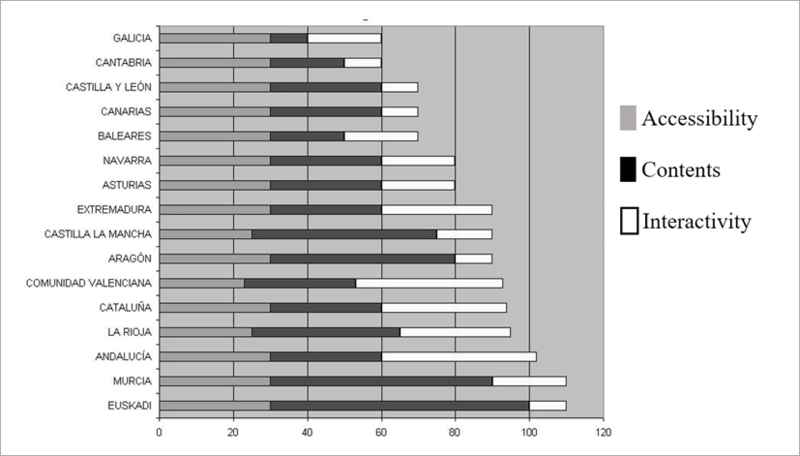 The analysis indicates that, despite existing significant inequalities, especially in the area of interactivity, none of the parliaments reaches 50% of the maximum scores of 240 points in any of these areas, which demonstrates there is a large room for improvement. In contrast to previous studies (Callison, 2003; Xifra, 2011), this research provides a view of the online press rooms as communication tools for both the media as well as citizens. The results corroborate the initial hypothesis and ratify the previous trends in other related areas, such as political and institutional communication at different territorial levels (García and Vázquez, 2012; Cantalapiedra, Iturregui and García, 2012). Thus, regional parliaments in Spain maintain classic, one-way communication models that is oblivious to technological innovations, which would promote greater involvement of citizens in a sector that needs to reinforce this area insofar as its funding is public. Most of the studied parliaments are assigned to a primary level of interactivity in their online press rooms. They mostly guaranteed free access to this type of platforms, but, once there, they underuse the tools and interactive resources that are technically available to stimulate and encourage citizen participation and promote the relations with the media. Another aspect affecting two-way communication is the provision of news content, which does not respond to a general approach with respect to the way they are structured and the types of contents that are included. Research shows that interactivity is not yet a consolidated parameter in the online press rooms of the regional institutions, and that, judging from the evolutionary line of the studies carried out so far, it does not appear that, for the moment, interactive tools will mean a substantial change in the relations between public institutions and citizens. As all content analyses, this study carried out an in-depth examination of the practices of parliamentary institutions in a specific point in time, in a setting, the internet, which evolves continuously. However, despite the limitations, this study provides parameters of interest to better understand how institutions are using online press rooms as tools for a two-way relationship with their audiences. In terms of future lines of research, the main route is to replicate this research in the regional structures of other countries in order to draw an international comparative perspective, and to carry out interviews with the people responsible for these spaces to delve into the causes that explain the data obtained, in addition to longitudinal studies that show the evolution of the parameters. *Funded research: This research work has been funded by the XESCOM network (REDES 2016 GI-1641 XESCOM), of the Department of Culture, Education and University Management of the Xunta of Galicia, with reference ED341D R2016/019. This includes well-known cases like the Canarian Parliament which in one of its publications chose a photograph that is a screenshot of the accompanying video and has the typical Play triangle button on top of the image. The study of the verbal tenses used in the headlines of the corresponding press releases allows us to establish a clear relationship between the use of the future tense and the absence of photographs, given that 11 of the 15 press releases that are not accompanied by an image use this tense. This press room is also unique because it is the only one that includes a montage in which the real image is used to create text bands on the top and bottom to summon citizens to an open day, informing about the day and hour in which it will be held. Logically, we excluded from the presentation of results the block of the analysis table on “level of response to comments” given the complete absence of input from users. Arterton, F. Christopher (1987): Teledemocracy: Can Technology Protect Democracy? Londres: Sage. Aruguete, Natalia (2017): “The agenda setting hypothesis in the new media environment”. Comunicación y Sociedad, 28, 35-58. Barradas, Claúdia Liz de Castro Pacheco (2016): Las salas de prensa online – Estudio de los municipios portugueses. Una propuesta de sala de prensa virtual. PhD thesis. Universidad de Extremadura. Castells, Manuel (1998): La era de la información. Madrid: Alianza. Castillo, Antonio (2006): “Public relations and press room. Análisis de las salas de prensa virtuales de las grandes empresas de España”. Razón y Palabra, 49. Dader, José Luis (2003): “Ciberdemocracia y ciberparlamento. El uso de correo electrónico entre los parlamentarios españoles y ciudadanos comunes (1999-2001)”. Telos, 55, 86-96. Dader, José Luis; Campos, Eva (2006): “Internet parlamentario en España (1999-2005)”. Zer, 20, 105-132. Del Rey, Javier (1996): Democracia y posmodernidad. Teoría General de la Información. Madrid: Complutense. Díaz-Campo, Jesús; Segado-Boj, Francisco (2015): “El uso de Facebook por parte de los ciberparlamentarios españoles”. Chasqui, 130, 365-379. Duke, Shearlean (2001): “E-Mail: Essential in Media Relations, But No Replacement for Face-To-Face Communication”. Public Relations Quarterly, 46 (4), 19. Echevarría, Javier (1999): Los señores del aire: telepolis y el tercer entorno. Barcelona: Destino. Holmes, David (1997): Virtual Politics. Identity and Community in Cyberspace. Londres: Sage. García Orosa, Berta (2009): “Aproximación teórica a la comunicación en el Tercer Sector. La necesaria reclasificación de la comunicación organizacional”. Telos, 69. García Orosa, Berta; Vázquez Sande, Pablo (2013): “Las salas de prensa on line en la administración local, ¿información de partido político o servicio al ciudadano?”. In SANTOS, Clara Janneth (coord. ): Últimas tendencias en modelos de investigación en el EEES y en otros sistemas actuales (313-336). Madrid: Visión Libros. Genaut, Aingeru; Marauri, Iñigo; Cantalapiedra, María José; Rodríguez, María del Mar (2017): “Menextra: Designing a Professional Service for Media Alert Management and Distribution”. En FREIRE, Francisco; RÚAS, Xosé, MARTÍNEZ, Valentín Alejandro; LÓPEZ, Xosé (eds): Media and Metamedia Management. Advances in Intelligent Systems and Computing, 503 (287-294). Springer, Cham. Grossman, Lawrence (1995): The electronic republic. New York: Penguin Books. Gustavsen, Petter Alexander; Tilley, Elspeth (2003): “Public relations communication through corporate websites: Towards an understanding of the role of interactivity”. Prism, 1 (1), 1-14. Hansen, Lucien; Jankowski, Nicholas W.; Etienne, Reinier (1996) : “Interactivity from the perspective of communication studies”. In JANKOWSKI, Nicholas W.; HANSEN, Lucien (eds. ): Contours of multimedia: Recent Technological, Theoretical and Empirical Developments (61-73). Luton: University of Luton. Momorella, Steve; Woodall, Ibrey (2005): “Evolution at work: Survey shows the structure of Fortune 500 online newsrooms”. Public Relations Tactics, 12 (5), 27. Naisbitt, John (1983): Macrotendencias: Diez nuevas orientaciones que están transformando nuestras vidas. Barcelona: Mitre. Pavlik, John V. (1996): New media technology. Needham Heights, MA: Allyn and Bacon. Pineda-Martínez, Paula; Castañeda Zumeta, Aitor (2014): “Comunicación dialógica y ciberparlamentos españoles”. Sphera Publica, Junio, 44-63. Plummer, Amy Watson (1995): “Managing media relations in cyberspace”. Public Relations Tactics, 2 (6), 18. Ramírez-Alujas, Álvaro (2013): “Los nuevos desafíos de la dirección pública en el contexto del Gobierno abierto: Gobernanza colaborativa, innovación abierta, co-creación y pensamiento de diseño en la gestión pública”. Revista Buen Gobierno, 14. Ruiz, María; Iturregui, Leire; Martín, Rosa (2017): “Creating a New Tool for Corporate Communication: The Open Communication Room (OCR)”. En FREIRE, Francisco; RÚAS, Xosé, MARTÍNEZ, Valentín Alejandro; LÓPEZ, Xosé (eds): Media and Metamedia Management. Advances in Intelligent Systems and Computing, 503 (279-285). Springer, Cham. Töffler, Alvin (1980): La Tercera Ola. Barcelona: Plaza y Janés. Tsagarousianou, Roza; Tambini, Damian; Brian, Cathy (eds.) (1998): Cyberdemocracy: Technology, Cities and Civic Networks. London: Routledge. Zamora, Rocío; Álvarez, Carlos (2006): “Las fronteras del (des)orden. Nuevos medios y nuevo espacio público: la ciberdemocracia en España”. Sphera Pública, 6, 15-47. Article received on 11 August 2017. Accepted on 14 November 2017.